It has been said that games lubricate the mind and this month’s games intend to do just that. 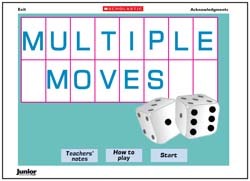 Both games can be played in pairs, small groups or as a whole class, and can be used in a variety of ways, such as to enrich teaching and learning, as a guided maths activity, as consolidation or extension material, within a maths club or as a homework assignment. Both games are designed to help children engage with particular concepts and make them their own. They challenge children to think for themselves and aim to promote self-awareness, independence and self-reliance. These hands-on and minds-on games also provide opportunities for teachers to question and discuss strategies, check and correct, assess children’s understanding and plan to overcome some of the blocks to mathematical thinking. Aims: Derive and recall division facts. Players: This game is for two players or teams. I have used the Interactive game with my class and they loved it! Gave them good practice for times tables.